The area’s finest crane operators gathered in Sanford, Fla., last Friday to boom, hoist, and swing their way to a $1,000 prize and a trip to Las Vegas to participate in the Crane & Rigging Hot Line & CIC National Skills Competition. Hosted by Crane Institute of America, the Florida Crane Owners’ Council, and M&P Specialty Insurance, the Sanford regional qualifying event provided a stage for operators to showcase their skills for fellow crane operators, family and friends. Each competitor was given a five-minute warmup period to acclimate themselves to the crane, a 90-ton capacity Grove TMS 9000E supplied by Crane Rental Corp. Next, each demonstrated their skills in a series of three events. The first skill test, the barrel dump, involved lowering a headache ball into a barrel, raising it up and then moving and lowering it into a second barrel, all without moving the barrels. In the second test, the operators maneuvered a water-filled drum through a slalom course. Competitors were required to keep the 3-foot chain attached to the bottom of the drum in contact with the ground at all times, weaving the load through the course without disturbing any of the barrels in the slalom. The final challenge involved lifting a 10-foot, cement-filled PVC pipe from a horizontal position on the ground placed within a set of cones. The operators were asked set the pipe to a vertical position, move it through the space within cones while in the vertical position, and then lay it back down on the ground without moving the cones. Though each skill test was not timed, points were given based on how quickly and cleanly the operators completed each task. Mark Adcock of Crane Rental Corp. was the first of nine crane operators to take the challenge. Adcock placed second in the regional event last year, and second in the national competition as well. But it was first-time competitor Thomas Cunningham of Sims Crane in Orlando, the second operator to take the controls during the event, who had the score to beat. He kept the lead for the remainder of the competition. Kenneth Bowyer of All Crane Rental in Apopka, also a first-time competitor, took second place. 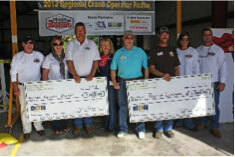 Cunningham and Bowyer each received a $1,000 check from M & P Specialty Insurance and $1,100 from the Florida Crane Owners’ Council membership to go toward expenses on their trip to ConExpo in Las Vegas, where they will compete against the other winners of the regional qualifying events for the national title. It was a challenging course, Cunningham said, one that tasks operators to perform multiple functions at a time. He added that he usually runs a 200-ton Tadano all-terrain crane, one much larger than the crane used in the competition. “That pipe’s I think the hardest. It’s hard to swing a pipe up like that and it not be swinging everywhere,” he said. Smith said the course challenges demonstrate the skills an operator may use on the job at a construction site. As the competition went on, operators, their families, and other spectators enjoyed chilled bottled water provided by CIA to keep them cool, as well as a catered lunch with sides provided by CIA staff. Attendees played corn hole as they awaited each score, and kids were treated to their own room which offered games and kid-friendly movies. CIA also provided a game called “Name That Component,” that tasked players with identifying close-up photographs various crane parts. Those who participated received a T-shirt, and players with the most correct answers were awarded a Lowe’s gift card. In addition to operators’ friends and family, the event attracted non-industry folks like Becky Young of Sanford to the event. Amy McElrath, vice president of sales and marketing for sponsor M&P Specialty Insurance, said events like the skills competition highlight the importance of becoming certified as a crane operator and knowing the proper safety procedures. In addition to raising awareness for the industry, the event also gave back to the community in the form of a donation to the Salvation Army. Susan Headley of CIA urged attendees to make donations to a Salvation Army kettle bell and presented Sgt. Tim Roberts with a check for $1,000. “Salvation Army is a wonderful ministry and charity, and it is number one when it comes to the amount of money that gets out in the field to minister to people,” said CIA’s Jim Headley during the check presentation. The funds will be used towards the organization’s Angel Tree program, which provides gifts to children whose parents are incarcerated.